Veronica Darling: Cutie little badges! She just got sent it in the mail today, and it's a little WOODY ALLEN badge, made by this guy we kinda know called John! You've totally gotta check out his website, it's called Sniffle Co and so lovely! Gettit? 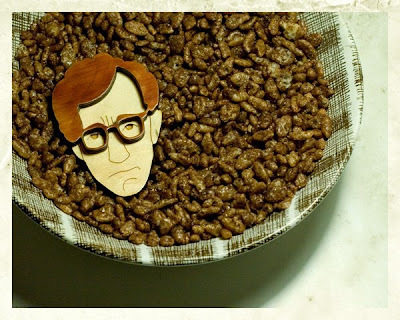 A wooden badge of WOODY Allen? Ha Ha Ha. I saw one of these and wondered about their origin....Amanda Keller was wearing one on Top Gear Australia on Monday night! I love his little cassette tape buttons! I got my Husband one for his birthday a while back. Then Patience was wearing one on that lame-but-I-love-Sean-Micaliff show on channel ten and we got very excited!!!! I guess that's when Amanda Keller decided she needed one!